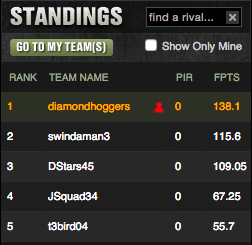 Diamondhoggers locked down over 50 points from their pitchers – Felix Hernandez and Andrew Cashner – and had 20 or more points from Mike Trout and Joey Votto that swung the Friday Gentleman’s Cup Circut Game in their favor. We see a slight change in the yearly standings with Swindaman3 overtaking t3bird04 for the second spot in the standings. The bottom two remain unchanged despite the separation amount between last place and fourth. The Gentleman’s Game Turd of the week was probably Michael Pineda, owned by two contestants in the Gents Game and scoring just over five points. That Minnesota Twins lineup may look cute and cuddly like a Peregrine Falcon, but when you get too close and you’re unsuspecting; they’ll rip your damn face right off. The Gentleman’s Game MVP had to be Coors Field Joey Votto. He hit a dramatic home run in the top of the ninth inning and although the Reds found a way to still blow the game; Votto swung the Gents game late, leapfrogging Diamondhoggers from third to first in a matter of seconds. That said; Jose Quintana was used by one man only: Swindaman3. 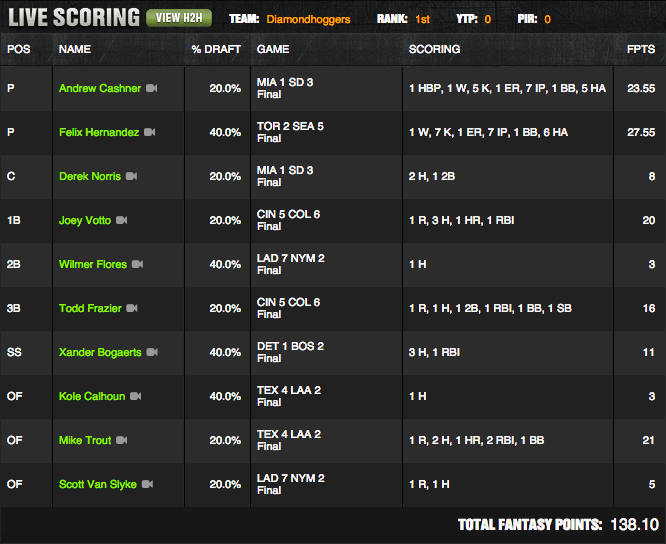 Quintana of course shut out the Indians and struck out eight, garnering 41.05 Draftkings points. This was probably the craftiest pick of the night even in a losing effort for Swindaman3. So what will happen next week? Will Diamondhoggers put their trust in another man who is not worthy like an Andrew Cashner to swerve the rest of the gentleman? Will Swindaman3 make another beach lineup before the sun sets on summer? Which contestant will have milk poured on them like celebratory champagne at a live final? You must tune in next week to find out, as we inch closer to crowning the greatest daily fantasy baseball champion of all time.